BEACH HOUSE @ the Fillmore (Miami) (10/13/10) | We Moved!!! BEACH HOUSE‘s first-ever Miami concert was absolutely amazing. Not just because it was a first visit for the band after 5 years of touring. Not because the venue, Miami Beach’s Fillmore Theater, boasts 50-foot ceilings and enormous chandeliers to end all enormous chandeliers. Not just because in January we gave BEACH HOUSE’s newest LP Teen Dream a perfect 100, which we did. 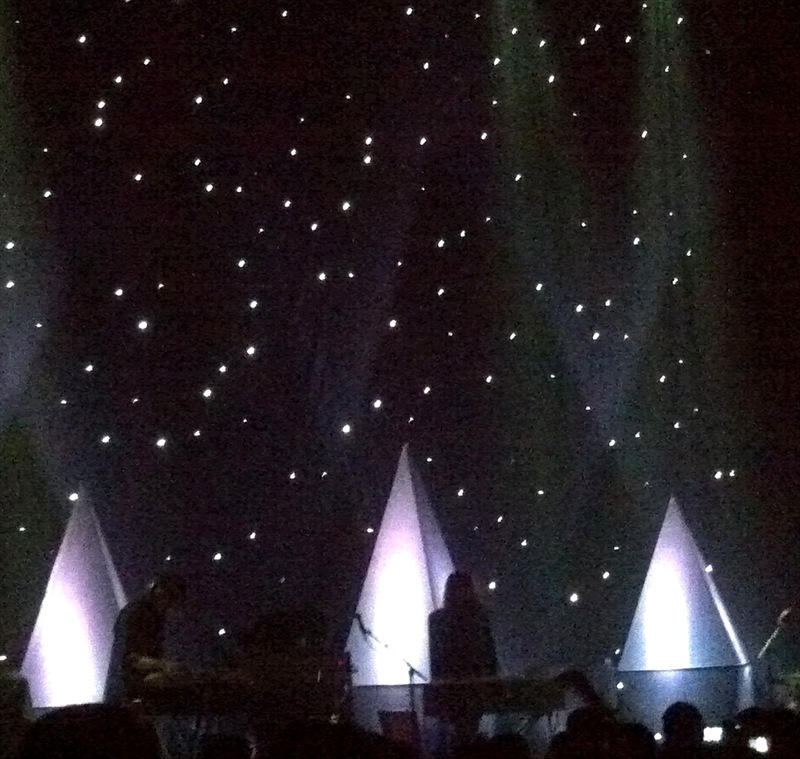 No, this show was just amazing, on its own, cuz BEACH HOUSE performed an almost perfect set. Cognizant of their own relative “newness” to Miami, the duo of Alex Scally and Victoria Legrand stuck close to the material from their newest/best album Teen Dream. They clearly recognized that this crowd, most of whom were there to see headliner VAMPIRE WEEKEND, would only know Teen Dream if they knew any of BEACH HOUSE’s material at all. The sold-out audience either did actually know of Teen Dream, or they were just incredibly receptive to BEACH HOUSE, because after nearly every song Miami’s youth blew up in appreciation; every step of the way. In fact, the biggest difference between this show and those that I’d seen in NYC was the audience. Maybe it was a reaction to how musically starved South Florida is. Maybe it’s cuz Miami is a hotter and more lively, dance oriented town. Maybe NYC just takes all these bands for granted. Whatever the reason, the crowd was electric, vocal and most importantly, thankful. BEACH HOUSE’s stage set-up is subtle, but it maintains an appearance of grandeur that fits perfectly with Alex Scally’s intense compositions and the booming voice that pours out of Victoria Legrand. Accompanying the duo and their backing band onstage are three large silver pyramids. The stage background, all 50-feet-tall of it, sports twinkling lights amidst a black velvety pallet. Gorgeous. The whole thing was gorgeous. From Walk in the Park to 10 Mile Stereo. From Norway to Take Care. Everything was pitch perfect. Victoria Legrand, unfortunately, expressed disappointment in the fact that on her first visit to Miami, she was welcomed by rain. Well, what she didn’t know was that just as she was saying that, the rain cleared away and opened up into a soft breezy Miami night. During the show, Victoria said she’d come back. I know I speak for Miami when I say “please do.” Make sure you don’t miss this tour. This band’s live performance is something to behold. This entry was posted in Concert Reviews and tagged BEACH HOUSE, the Fillmore. Bookmark the permalink.